Main routes to the Highlands have been voted the three most unpopular roads in Scotland, according to a new poll. For the second year running the A96 from Inverness to Aberdeen has come out worst in the Rural Community Gateway internet survey of motorists. The A9 Stirling-Thurso run was second most unpopular and the A82 Loch Lomond-Inverness drive was third. Gateway is a partnership with the Scottish Executive and Scottish Council for Voluntary Organisations. The A96 polled 97 of the 359 votes cast in the survey of 13 routes, which also included journeys on the A75 Gretna-Stranraer and A1 Edinburgh-Berwick Upon Tweed. A spokesman for Rural Community Gateway said: "According to some there are no bad roads just bad drivers, but you might be hard-pressed to find anyone who has a good word to say about the A96 Aberdeen to Inverness road. "For the second time running the tortuous north route has topped a Rural Gateway poll of unpopular roads. In May we offered users a choice of 13 key rural routes and asked: 'Which road do you hate driving most?'." Neil Greig, of the AA Motoring Trust, said the poll held few surprises. He said: "There is no doubt the main roads into the Highlands still have problems. 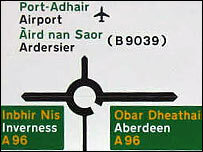 People setting off to Inverness from Aberdeen or Perth still face a challenging journey. "Most concerns are about Perth to Pitlochry and getting that dualled." Mr Greig described the A9 north of Inverness as "old fashioned" and "twisting".